Sometimes, installing an embedded snow melting system is not the most practical answer for providing clear walkways in the winter. WarmTrax heated traction mats offer an affordable solution for melting snow and ice from sidewalks, ramps, steps, and porches. Mats are available for residential and industrial snow melting applications, in a variety of sizes. Constructed from the highest quality materials, the snow melting mats are designed to melt snow at a rate of 2-inches per hour. The mats provide traction and durability over a long lifespan. The industrial heating mats are made to fit most electrical outlets, including standard 120V, 240V, or 208V outlets. The mat can be secured to the ground using its built-in grommet holes and is designed to be left outside for the entire winter season. Each industrial snow melting mat comes with its own ELCI plug (equipment leakage circuit interrupter). For more detailed information about connecting several mats together, call an expert at 888.488.9276. The heated mats help to ensure safe, ice free walks for homeowners as well as business owners. Designed with a continuous chevron pattern to provide extra traction, the portable mats can be placed near entryways and exits for commercial facilities to provide slip prevention and protect business owners from personal injury and subsequent law suits. 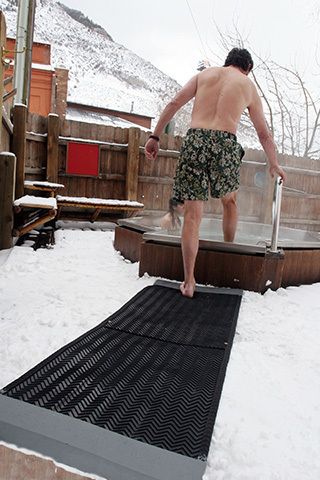 The mats increase traction in snowy and rainy conditions. In addition to a wide variety of heating mats for walks and entryways, WarmTrax also offers affordable options for heating stair treads. 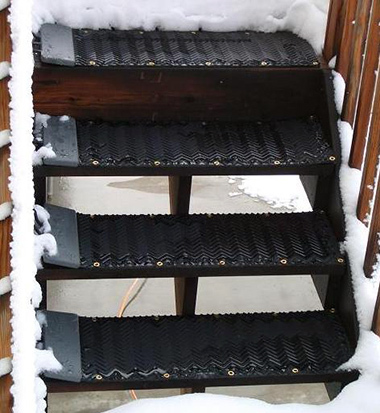 Durable heated rubber mats as well as aluminum treads are available to keep staircases free of snow and ice. The traction mats can be daisy-chained together to cover long staircases or just a few steps that lead to a porch. These convenient portable snow melting solutions are a popular means of enhancing safety, and the systems are built to last, and are very easy to use. WarmTrax portable heating mats are a great alternative to more expensive and labor intensive snow removal methods for keeping walkways, ramps and high-traffic areas safe for pedestrians. This cost effective solution makes safe sidewalks and entryways a viable option for homeowners and businesses. The heated snow melting mats are made of the highest quality materials so they can withstand harsh weather conditions and repeated use. The mats are constructed with a rugged heating element that is sandwiched between two high-grade, protective surfaces of customized non-slip thermoplastic material. The rugged material makes the mats as durable as automobile tires. Many homeowners use the mats to keep driveways clear of snow and ice. The mats are tough enough to be driven on repeatedly and are easy to use. If you're looking for a snow melting solution to keep sidewalks, porches, and even your driveway free of snow and ice this year, consider a portable heating mat. The WarmTrax mats are available in a variety of sizes and are easy to use. Create your perfect driveway snow removal and snow melting solution without tearing up your asphalt or concrete driveway to install an expensive system. Eliminate back breaking work shoveling snow and black ice, and enjoy never being late to work again during the winter months. WarmTrax snow melting mats come with a 2-year manufacturer warranty. The portable heating mats and stair treads plug directly into any standard 120V or 240V outlet using its own equipment leakage circuit interrupter (ELCI). With the mats' built-in watertight connector cables, you can connect residential mats to create your perfect snow melting solution — all on a single plug! There is no need for expensive installation. The WarmTrax products are portable, designed to lie on top of existing surfaces. Place a WarmTrax mat over existing entrance ways, stairs, loading docks, handicap ramps, rooftops, and many other surfaces, to provide a clean and safe passageway for foot or wheelchair access. WarmTrax heated mats are a proven solution for slip prevention. The WarmTrax products continuously melt snow and ice to consistently keep walkways clear and safe. The durable heated rubber is designed with a continuous chevron pattern to provide extra traction. The WarmTrax mats are a clean, efficient alternative for keeping areas clear of ice and snow than salt or other snow melting chemicals. Salting entryways results in calcium chloride being tracked inside by foot traffic, leading to messy floors and a lousy first impression for businesses. In addition to eliminating the mess and harmful runoff from snowmelt chemicals, WarmTrax heated mats help to preserve sidewalks by eliminating the need for calcium chloride that degrades walkways over time. Engineers have taken great care to develop a durable, safe and effective snow and ice melting solution. The WarmTrax products are made of an electrically operated heating element inserted between two protective surfaces of non-slip rubber to provide a very sturdy portable snow melting solution. The WarmTrax products plug directly into any standard 120V or 240V outlet using their own equipment leakage circuit interrupter (ELCI). WarmTrax offers a variety of residential and industrial heated mats. Whether you’re looking to heat a small square porch, a few steps, or an entire driveway, WarmTrax can provide you with the ideal portable heating solution. Residential mats operate on 120V while industrial mats can be manufactured to operate on either 120V, 208V or 240V current. The industrial heated snow melting mats feature rubber material that is even more durable than the thermoplastic material used in the residential mats. Industrial mats are designed for high traffic areas with hundreds of people walking on them every day. The more affordable residential mats are still very durable, but intended for lighter pedestrian traffic that is typical for most homes. The residential walkway mats come in sizes of 20" x 60" and 30" x 60", while stair mats are available in sizes of 10" x 30" and 10" x 48" - sizes that are likely too small for most industrial applications. The industrial mats come in a variety of lengths and widths and can even be made in custom sizes. In contrast to the residential walkway mats that need to be daisy-chained together to cover large areas, the industrial walkway mats come in large enough sizes to cover large sections of walkways without the need for multiple connector cables. For example, to cover a 20-foot long walkway with the residential walkway mats, you will need four mats - each with a connector cable to allow them all to operate on a single plug. With the industrial walkway mats, you can purchase one mat that is 20-feet long, requiring no connector cables along the walkway. This is preferable to the safety conscious maintenance professional. (Note: the industrial stair mats daisy-chain together, but the connectors lie off to the side of the stair case and are not a safety hazard.) To learn more about the many different portable snow melting and heated mat options, call 888-488-9276 today. WarmTrax Portable Snow Melting Mats - snow-mats.com © . All rights reserved. Various trademarks held by their respective owners.